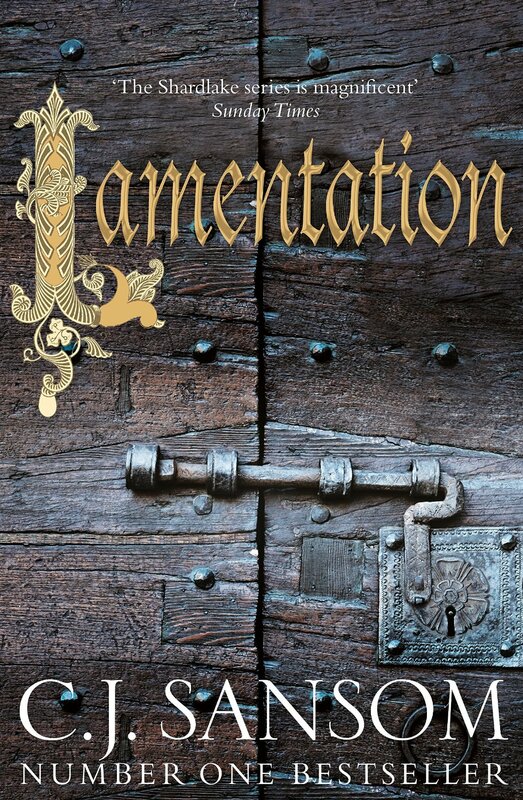 In a recent post on historical fiction, I wrote that I was reading Lamentation, the latest entry in C.J. Sansom’s Shardlake series. This series has won critical acclaim, and justly so, for the most part, I think. Yet as much as I was enjoying it, I found that the author’s research was obtruding upon the narrative. I have now finished the book and am happy to report that as the story gathered steam, that particular problem pretty much disappeared. I got caught up in this tale of court intrigue in the dying days of King Henry VIII’s reign. The fact that Queen Catherine Parr figures prominently in this story further enlivens the proceedings. At over six hundred pages, Lamentation is something of an undertaking. Be patient, though; the immersion in a turbulent and fascinating past is worth the effort. This is the only form of time travel we can aspire to – at least, so far. 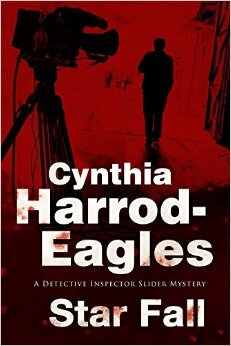 Cynthia Harrod-Eagles’s Bill Slider series is one of the few that I follow without question, and without troubling to read the reviews first. I know I’ll be thoroughly entertained, and thus it was with Star Fall, the seventeenth novel featuring Slider, Atherton, Swilley, and the rest of the Shepherd’s Bush crew. Their task this time around is to solve the murder of Rowland Egerton, a television personality whose program Antiques Galore has a large and enthusiastic following. Egerton is one of those celebrities whose publicly displayed bonhomie conceals a dubious personality rife with nasty proclivities. He’s a hard person to grieve for, but murder is murder and justice must be served. This is the kind of tightly wound contemporary British police procedural that I cherish. It follows a formula with delightful variations. He had the look of a man who had heard the leathery creak of the Erinyes’ wings in the darkness, smelled the chthonic reek of their breath, felt the clammy touch of their lips on the back of his neck. Well, gosh…Parse that, you grammarians! Although I consider myself one of their number, I admit I was flummoxed. It turns out that the Erinyes are better known as the Furies of ancient Greek mythology; “chthonic” literally means “subterranean.” (Thus saith Wikipedia, at any rate.) I sympathize wholeheartedly with this author’s apparently irresistible urge to show off her erudition. 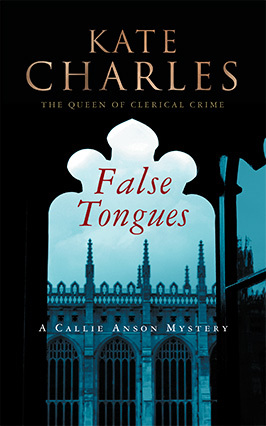 Recently I read False Tongues, the latest entry in a different series featuring Callie Anson, identified on Stop!YoureKillingMe – Kate Charles as “a newly ordained Anglican cleric.” Callie is a tenderhearted young woman, empathetic, sensitive, and easily hurt. To a certain degree, she is well suited to minister to the spiritual and emotional needs of others. At any rate, in False Tongues, she is struggling to recover from a broken heart so that, from both a personal and vocational perspective, she can once again feel whole and complete and ready to give of herself to others. This novel is enlivened by a host of interesting secondary characters, including Canon John Kingsley, a man of warmth and generous spirit who also appears in Appointed To Die. Like that earlier work, False Tongues is beautifully written and a thoroughly gratifying read. The plan was, I’d write up the Usual Suspects’ discussion of The Youth Hostel Murders, which I read some months ago. But in one of those ‘man-proposes-God disposes’ moments, I came down with a flu like illness which prevented my attendance at the discussion this past Tuesday. Still, I’d like to say a few words about the book, which was originally published in 1952. The youth hostel of the title is located in the Cumberland fells, in the far north of England. The chief protagonist is Abercrombie Lewker, a professional actor and manager who moonlights as an amateur but gifted sleuth. His wife Georgie – Georgina -does her best to keep her husband’s flights of fancy from becoming overly extravagant. He was a tall old man with scanty gray locks and very long and muscular arms. His gaunt body, bent like a question mark but still suggestive of great strength, was clad in an old velveteen coat with tails, much patched tweed breeches, and huge nailed boots. His face was weather-browned and bony, and the inordinate length of his bristly jaw gave him a horse-faced appearance which instantly reminded Georgie of William Wordsworth. Wordsworth? Really? Still, it’s a compelling description, one of several found in this novel. 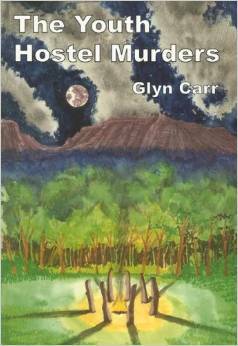 What did I like about The Youth Hostel Murders? The atmospherics, for one thing: the danger and eeriness of the fells. And Carr throws in a soupçon of witchcraft for good measure.The text is replete with quotes from Shakespeare. I particularly liked “hell’s black intelligencer,” as Queen Margaret venomously terms Richard III in the eponymous history play. Abercrombie Lewker is usually referred to as the “actor-manager” rather than just an actor. as though the additional designation would confer more status. He “booms” as opposed to merely speaking. He’s an avid climber, although he doesn’t seem cut out for this rugged sport. Pauline wrote me that she found him an “extremely annoying” character, and if you’ve ever spent time with someone who declaims rather than simply talking, you’ll know what she means. Georgie’s nickname for her scenery-chewing husband is “Filthy,” and Pauline found this likewise irritating. (So did I.) Marge, for her part, was put off by Carr’s prose style. I gather that for the rest of the Suspects, the verdict on the novel was generally positive, albeit with some reservations. Presently, The Youth Hostel Murders is a publication of the good people at Rue Morgue Press. Theirs is an extremely admirable initiative, aimed at bringing neglected classics and other unjustly ignored older titles back into print. Some of the authors currently on their list are Gladys Mitchell, Catherine Aird, John Dickson Carr, and Craig Rice. Click here for the complete list. Glyn Carr, by the way, is a pseudonym for Showell Styles, a remarkably prolific writer of whom I ‘d not previously heard. I’m next up for the Suspects, and I’ve just started rereading my selection, Temporary Perfections by Gianrico Carofiglio. I’m always a bit uneasy at this preliminary stage; I’ve had the experience of picking up a book group title that I’ve committed to but not actually read for some time, only to find myself wondering why I ever made that particular choice. That’s not happening with this book. I’m enjoying it all over again and I hope that my fellow Suspects feel the same. And those of you who were in attendance Tuesday night, please feel free to comment on this post and/or correct any errors. Even more importantly, I gained a sense of who Julius Caesar actually was and how he fits into the template of Roman history. 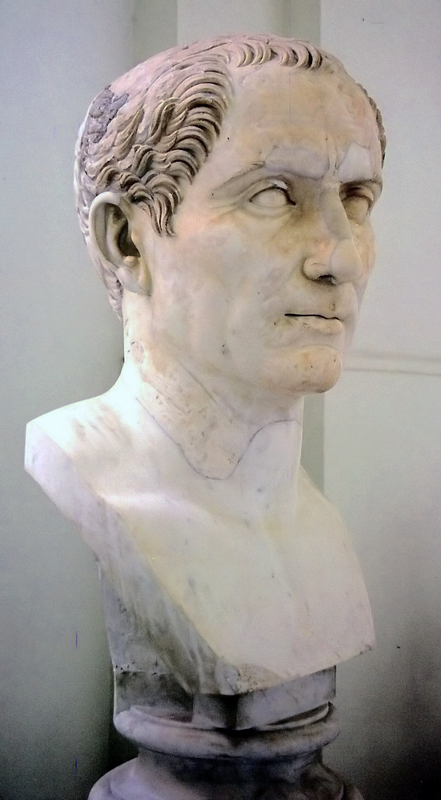 This bust of Caesar resides in the National Archaeological Museum in Naples. I was there in 2009. It’s a very fabulous place, but I don’t have a specific memory of seeing this sculpture. While he spent the next year in the East, winning allies, raising money, conquering rebels, and wooing a new mistress, Caesar sent Antony back to Rome. There Antony arranged for Caesar to be dictator for the year and for himself to be Master of the Horse (Magister Equitum), as a dictator’s second-in-command was called. This was Caesar’s second dictatorship. It dismayed lovers of liberty. Meanwhile, traditionalists took offense at Antony’s rowdy and degenerate lifestyle, which he resumed with abandon. The sources speak of wild nights, public hangovers, vomiting in the Forum, and chariots pulled by lions. It was hard to miss his affair with an actress and ex-slave with the stage name of Cytheris, “Venus’s Girl,” since she and Antony traveled together in public in a litter. Of all the powerful women of the era, Fulvia is in a class of her own. She alone once wore a sword and recruited an army, which earned her the backhanded compliment of having her name inscribed on her enemy’s sling bullets along with rude references to her body parts. But she did most of her fighting with words. A populist through and through, Fulvia married three politicians in turn: the street-fighting demagogue Clodius, Curio— a People’s Tribune who supported Caesar— and finally and most fatefully, Antony. Antony’s enemies claimed that Fulvia controlled him, which is not true. But this strong woman probably stiffened his spine and she almost certainly shared with Antony the political skills learned from her two earlier husbands. Coming under the dictator’s inspection could only have been a daunting prospect, even if at fifty-five Caesar was beginning to show his age. He was subject to dizzy spells, possibly a symptom of the epilepsy that brought him infrequent seizures. He was balding. After nearly fifteen years of war, his face was creased and his cheeks sunken. Yet Caesar still was cunning and dangerous. He personified talent, strategy, memory, literature, prudence, meticulousness, reasoning, and hard work, as a contemporary said. Strauss provides plenty of background for the run-up to the assassination, but it’s in the moments immediately preceding the killing that his narrative becomes truly gripping. This, and the ghost of Shakespeare hovering over the narrative, had this reader well nigh mesmerized. There now took place the famous exchange between the dictator and the soothsayer. 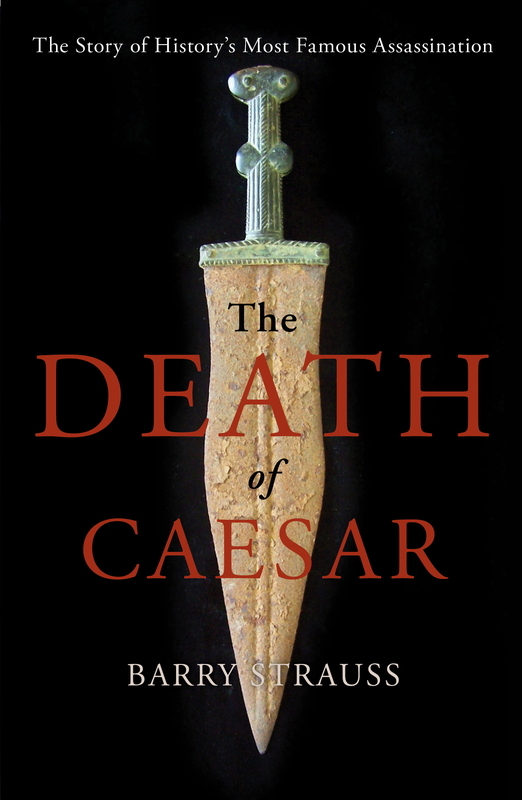 “The Ides of March have come,” said Caesar. “Aye, they have come but not gone,” replied the soothsayer in one of history’s memorable comebacks. …Plutarch (c. 46-c. 120 CE), Suetonius (c. 66-c. 122 CE), Appian (c. 95-c. 165 CE), Cassius Dio (c. 155-235 CE) and, last but not least, Nicolaus of Damascus (c. 64 BCE-14 CE). This book is 362 pages long in hard copy. A great deal of space is at the end is given over to photographs, notes, and information on sources. (I read the e-book and nearly missed the photographs, which are marvelous.) It was over too soon. I loved it.